The outgoing Lib Dem leader is pushing some bold - and risky - reforms of the party. 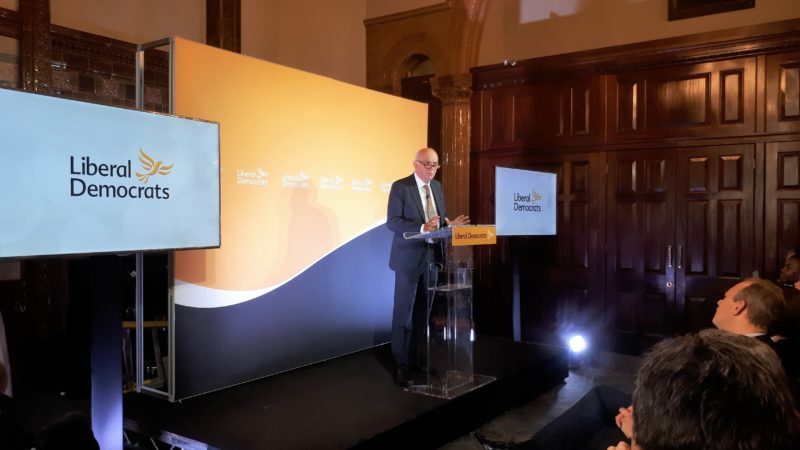 Vince Cable presented his plans to revamp the Liberal Democrats at the National Liberal Club today. Here’s what we learnt. In July, the Lib Dem leader denied plotting to found a new party – despite missing a crucial Brexit vote for a ‘private meeting’, apparently with other centrists. Now has has responded to those claims directly – saying he has been warning against the founding of new parties: “It is patently clear from the open contempt shown for many Labour MPs by Jeremy Corbyn’s hard left supporters that a schism is likely. Some Conservatives are in a similar position. Meanwhile, there is a smattering of business people around talking in hushed tones about a new party. People will be able to sign up as ‘registered supporters’ (much like in Labour) – for free. It costs £3 to join Labour’s scheme – a token amount to stave off trolls. But in giving outsiders a say, there are fears that ‘infiltrators’ could join the party to change policy or sabotage a leadership race – fears that Labour faced during Jeremy Corbyn’s election, and now in the Tories through Arron Banks’ attempts to push the party in a hard-right direction. Pro-independence supporters in Scotland could for example push the Lib Dems in a pro-indy direction – and Labour left-wingers in theory could sway a Lib Dem leadership result if there are no barriers. The ‘arbitrary’ minimum membership time of 12 months before people are allowed to stand for office will be scrapped, if the plans pass. And – crucially for this small party – leadership of the party will be opened up to non-MPs. There have been rumours anti-Brexit campaigner Gina Miller would be encouraged to stand – but she has ruled this out. ‘Brexit being resolved’ if a vague enough timeline to give him some breathing room, but his departure will almost certainly be in 2019. Cable indirectly pointed to the success of Emmanuel Macron’s En Marche! movement in France, as well as Justin Trudeau’s Liberal surge in Canada. The 2015 election there saw the Liberals go from 36 seats to 184. “There are encouraging counter-currents and we need to learn from them,” Cable said. In building a ‘movement for moderates’, Cable is seeking to emulate the success of left-wing Labour group Momentum, which has been has ‘highly successful in mobilising and engaging young people’. Momentum of course rejected the comparison. Laura Parker said: “Lowering membership fees and making more memes are not going to solve Vince Cable’s problems. Though determined to stand down after Brexit, another snap election (say, after a Tory leadership challenge) isn’t totally off the cards. I asked him if he’d consider going into coalition with Labour or the Tories. His reaction was a cross between disgust and amusement: “No.” A bold statement given he wants the Lib Dems to be a party of government. At any rate, the Lib Dems should be congratulated for trying to open up and take advantage of anti-Brexit sentiment outside the party. Who knows what could happen if the party reforms pass?